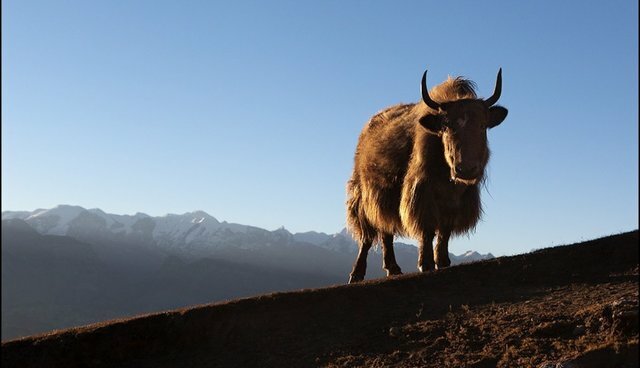 Chinese and American biologists report that after yak mothers give birth, they'll climb around the Tibetan Plateau with their calves at heights of about 16,000 feet. Unlike solo yaks, these moms head for the steepest hills, according to a new study published in the Journal of Mammalogy. Male yaks, which tend to travel in pairs instead of the mom-led groups, hang out in the valleys, rather than scaling more rugged terrain. The researchers aren't entirely sure why yak mothers go to such steep heights with their children, but they believe that the shaggy mammals avoid predators and find food by sticking to the slopes. Wild yaks are endangered and under pressure from humans, who herd domesticated livestock into the same territories. In response to this encroachment, wild yaks have retreated westward to the parts of the Tibetan Plateau where the habitat has not yet been destroyed or fractured. "Here we have a throwback to the Pleistocene," states Wildlife Conservation Society biologist Joel Berger, an author of the study. Preserving the Tibetan Plateau is vital, as it provides the "opportunity to conserve a species, not to mention an ecosystem and a landscape that is larger than all of Montana and Nebraska combined."